Photographed the Baldwinsville Bees playing the Syracuse East Black Knights in a midweek lacrosse game in typical central New York Spring weather. A Baldwinsville Bees player checks the Syracuse East Black Knight ball carrier in a Spring lacrosse game in Syracuse, New York. Nikon D7100, 70-200VR, 1/640s, f/2.8, ISO 1400, EV 0, 200mm focal length (400mm 1.3x). The rain and wind did not let up for the entire game leaving players, spectators and one photographer drenched by the time the last horn sounded. The Bees did not mind the weather at all posting a 14-5 win. 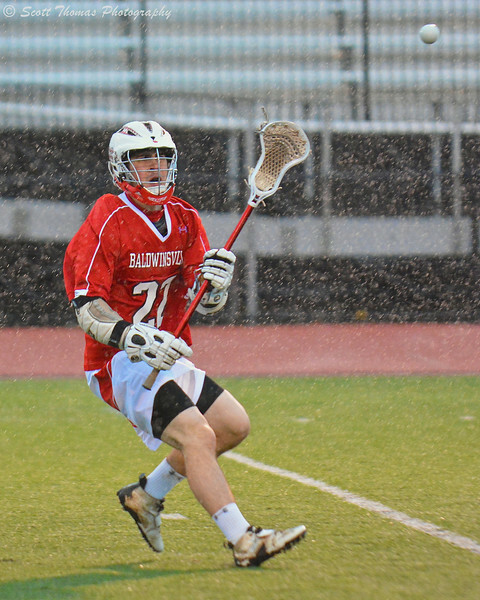 Baldwinsville Bees Matt Zandri (22) passes the lacrosse ball against the Syracuse East Black Knights on Tuesday, April 16, 2013. Baldwinsville Bees won 14-5. While I did not stay dry, my Nikon D7100 camera did as I used an OP/TECH Rainsleeve to cover the camera and lens. Best $3.00 investment I ever made. 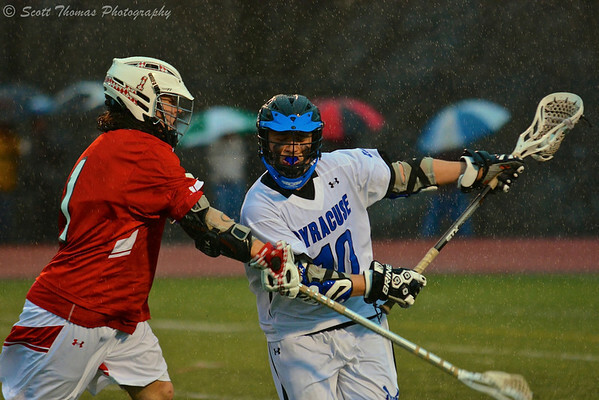 This entry was posted in Sports and tagged 70-200mm, baldwinsville, bees, black knights, boys, east, lacrosse, lights, new york, night, nikon D7100, optech, rain, rainsleeve, spring, syracuse, vr. Bookmark the permalink.